When you want an improved garage, you can rely on Custom Garage Works! We have been offering a variety of custom garage services such as garage floor coating in Southlake, TX since we originally started in 2003. After searching high and low in the existing industry, we were shocked to find very few options that were up to a professional standard, so we got into the industry ourselves, to turn things around. 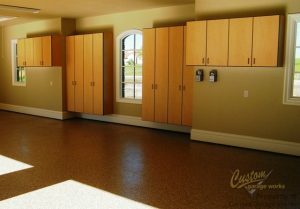 We now provide our clients some of the greatest custom garage solutions around, including top quality cabinets and incredibly durable floor coatings that out-preform epoxy coatings. We are committed to excellence, and we love providing excellent garage floor coating and custom garage solutions throughout the DFW area. 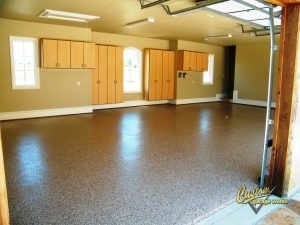 Our custom garage floor coating in Southlake, TX is one of our most popular garage options! This coating is so popular because it is both more resilient, and cures faster than traditional epoxy. Unlike epoxy that will yellow in the sun, and peel or fall off over time, these coatings are stronger and more durable. In addition to our floor preparation, which includes professional diamond grinding, as opposed to acid etching, the end result is a showroom quality floor that is easy to clean, and practically indestructible. If you’d like to learn more about our reliable garage floor coating services, give us a ring at 214-494-9068 or 817-308-1305 and ask for your free estimate! Polyurea Polyaspartic Coatings These coatings have a shorter cure time than epoxy, and are resistant to UV rays and discoloring. And More! If you would like to discover more about the services we offer, you can look at them here! Thanks to Custom Garage Works’ storage solutions, you won’t ever need to worry about running out of space in your garage again. We know that a brand new garage floor looks best when it isn’t covered by other items in your garage. We offer a selection of solutions to sort your belongings, including overhead storage racks as well as garage cabinets. Unlike other companies, our storage racks are designed for heavy duty weights, and our storage cabinets are designed specifically for installation in garages. For a reliable garage floor coating in Southlake, TX that will last for year after year, and an organization solution that cannot be beat, you can depend on Custom Garage Works! Overhead Storage Racks Do not waste your overhead space! Our overhead storage racks let you get the most from your garage. Storage Cabinets Unlike traditional cabinets, these are designed specifically to help you get more out of your garage storage! Car Lifts Are you running out of space for your cars? Our garage auto lifts can assist you! And More! We offer a wide selection of garage organization solutions to our clients, to provide the ultimate custom garage!